Hi everyone! I'm Kim. I have been an MLP lover since I was little and recently re-discovered my childhood collection in great condition! I will be keeping some favorites for my daughter (and myself, let's be honest) but will probably have some G1 ponies available for sale soon too. I'd love for them to find new loving homes. Welcome!! I’m sure you’ll find some great homes for your past toy loves here. Welcome to the herd! 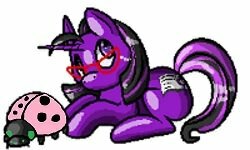 I'm sure your ponies will reach awesome new homes Enjoy the forum! oooh, how exciting! Welcome to the Trading Post! Welcome to the herd! Glad to have you!